No wonder Honda’s Civic seems to have been around for as long as I can remember. It turns out it’s actually older than me; the first one came out in July 1972. I, should you be you interested in such things, arrived in the June of the following year. I’ll let you do the maths. 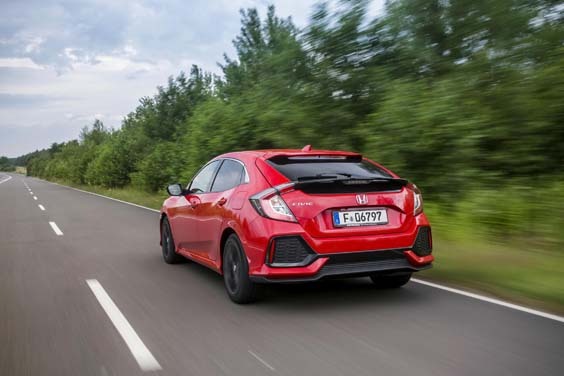 Originally conceived as a two door, with a three door following soon after, the Civic was introduced with a 1,169cc transverse front engine and front-wheel drive. It won praise for its interior space, despite its diminutive dimensions, and soon gained a reputation – like a many a Honda thereafter – for being reliable, fuel efficient and environmentally friendly. Needless to say a lot’s changed since the early ’70s – not least the colour of my hair – but whereas there’s been no further generations on my part, the Civic you see here before you is in fact the tenth reincarnation of the original. Like all forty-somethings the Civic has grown up somewhat. Today’s consumer demand, with far more stringent crash-testing and occupant protection legislation than there once was (you didn’t get multiple air-bags, Lane Departure Warning, and things like Collision Mitigation Braking and intelligent Adaptive Cruise Control when I were a lad), means the new Civic is wider, longer and lower than the car it replaces. It’s now actually one of the largest compact family hatchbacks you can buy. It’ll seat five, as long as everyone gets on, and at 478 litres the boot is the biggest in its class – presumably in part of there being no spare wheel. The Civic say Honda “has been reimagined”. Quite who “reimagined” the Civic’s new exterior I’m not exactly sure, but it’s… well, shall we say distinctive to be polite? In my opinion the triangular 8th generation Civic had the neatest lines, whereas this one feels over-styled. Apparently a Japanese designer drew it to appeal to an American market. 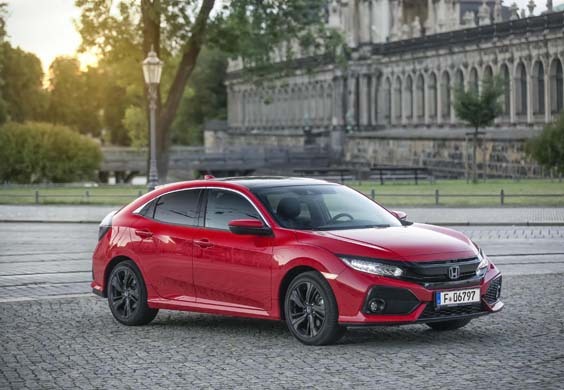 So that’s perhaps why to European eyes it all looks a bit busy; especially so when compared to the likes of SEAT’s Leon and new Ibiza, VW’s perennial Golf and all-new Polo, Peugeot’s 308 and Vauxhall’s much loved Astra – all of which could now be considered the Civic’s direct competition. Whilst in my possession the new Civic’s distinctive shape and looks proved to be opinion-splitting. It received numerous comments – but perhaps it’s best if we leave it there. Fortunately once you’re inside things aren’t quite so visually challenging. If anything the new Civic’s interior is more conventional, more sober you could say, than it once was. The distinctive split level dash has been consigned to the history books, there’s a new high and angled centre console, and you sit lower than you once did behind an altogether more conventional dashboard layout which houses clear TFT dials. Fit and finish are to the usual Honda millimetric tolerances and knobs swivel and move and switches switch with that nicely engineered and precise feel that we’ve come to expect from Honda. It’s just a shame they didn’t inject a bit more colour here and there in order to liven things up a little. There’s a lot of hard black plastic. The headlining in “our” car was black too. Oh! And one other thing. The new Civic doesn’t get Honda’s famous and brilliantly practical cinema-style “magic seats”. It’s as a result of the relocation of the fuel tank apparently. The Civic’s lost one of its key features. What were they thinking? Aesthetic and practicality niggles aside, what you can’t fault is how the Civic drives. Thanks in part to a new more sophisticated multi-link rear axle and a significantly stiffened unibody (with increases of 52% in torsional rigidity and 88% in lateral stiffness), the combination of overall refinement and composure is excellent. EX specced Civics such as ours also gain adaptive dampers, but to be honest they’re best when left in their softer Normal setting; Sport feels a tad too brittle for British tarmac. The steering is light and precise, the handling safe and secure and the gearshift short of throw. The standout feature however surely must be the engine. We sampled Honda’s 3-cylinder 998cc 12v turbo. Normally you’d think an engine of such tiny displacement would struggle to pull the skin from rice-pudding and make myriad noises of complaint whilst attempting to do so. Not this unit. Honestly, were it not for a trademark 3-pot thrum and a little vibration at higher revs (not that you’ll need them) you could easily be forgiven for assuming that you were driving a 1.6 or something even bigger. Quite how Honda squeezed 129bhp and 147.5 lb-ft out of such a tiny mill I’m really not sure but all credit to them for doing so. You will struggle to match their claims of 55.4 mpg in the real world, but even 5-up I managed 44.1 amongst the Shropshire Hills. It’s marvellous and – fleet buyers if you’re reading – makes the case for buying the 1.5 diesel option ever harder to justify. And the price? Our Turbo EX manual came in at £23,200. 45 years after the Civics first came to light its latest “re-imagining” has made it more refined, more comfortable and better to drive. But in doing so it’s also left the Civic with an interior that struggles to rival the best in its class and without those magic seats; garden centre goers will be left weeping the world over next time they buy a yukka plant. And of course there are the Civic’s new looks to contend with. Nevertheless, if you can live with the compromises there’s still a lot of life left in the Civic.